For a couple years now, pork has been in its heyday. Pork belly is the in vogue menu item, and bacon nearly has a cult following. However, on its November list of the Top 10 Food Trends for 2010, Epicurious.com predicted that lamb would trump pork as everyone’s favorite meat. A couple weeks ago we bought some lamb shoulder chops from Garden Spot Market with the plans to braised them in red wine & eat them over noodles. Now, I realize that slow braised meat isn't really something you'd typically eat at the end of May....but, until this week, the weather in St. Louis was downright chilly. In fact, I had to turn my heat back on a few evenings. All of a sudden, though, the summer heat is here. So, while this recipe made a great weekend dinner when it was unseasonably cool...I'm not sure I'd be making it THIS week in my unair-conditioned house. Nevertheless, it was a very tasty (and easy) dish to make. I'll definitely keep it in my repertoire for those unexpected cooler evenings. Put a 10-inch straight-sided saute pan over medium heat for 5 minutes. 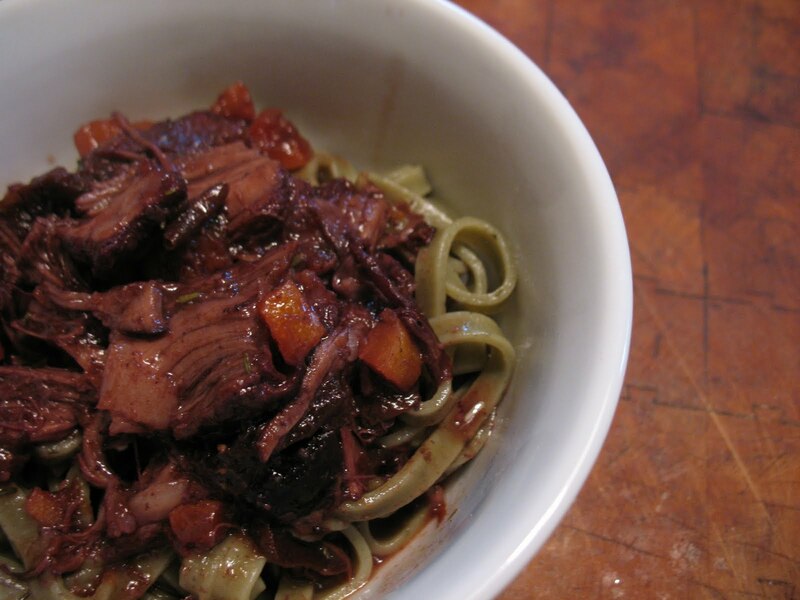 Toss the lamb with the olive oil in a medium mixing bowl. Season with salt & pepper. When the pan is hot, sear the lamb for 1 minute on each side. Remove to a plate and cool for 3 to 4 minutes. Add the meat to a 1-gallon resealable plastic bag, then pour in the 16 ounces of wine and the 4 rosemary sprigs (save the chopped leaves for later). Remove as much air as possible so that the wine is completely surrounding the meat. Put the bag in a container to prevent leaks and refrigerate for 3 hours. Heat the oven to 250 degrees F.
Transfer the contents of the bag back to the 10-inch straight-sided saute pan and cover. Put the pan on the middle rack of the oven and braise until the meat is tender and falling away from the bone, about 3 1/2 hours. Remove the meat from the oven to a platter. Discard the rosemary. Shred the meat, removing any bones, and cover with aluminum foil to keep warm while finishing the sauce. Pour the pan juices into a gravy separator and allow it to separate before pouring 2 cups of the liquid back into the pan (add more wine if needed to make 2 cups). Set the pan over medium-low heat and add the dried plums & apricots. Simmer, whisking frequently, until the sauce has reduced and thickened slightly, about 10 minutes. Whisk in the butter 1 piece at a time, adding another piece only after the previous piece has melted. Whisk in the remaining chopped rosemary and continue to cook for another minute. Taste and adjust seasoning by adding salt and pepper, if needed. Add the shredded meat to the pan with the sauce. Serve over egg noodles, polenta, or rice.